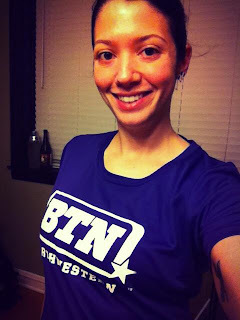 The BTN Big 10K holds a very special place in my heart. Not only because as a grad student at Northwestern, I get the opportunity to celebrate the Big 10 conference and my status as a Wildcat, but also because this race symbolizes my runnerversary. You may have seen me use this word on Twitter in the past few days. What does it mean? It's the anniversary of when I started running. In other words, it is the anniversary of the day that I changed my life forever. 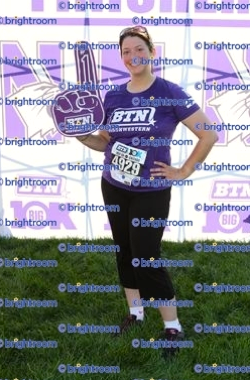 One year ago, I heard radio ads for the inaugural BTN Big 10K, and having already spent a few months in grad school, I thought it sounded fun. I signed up for the 5K -- the first race for which I had ever voluntarily registered. I was still about 30 lbs overweight, but was determined to do it. Come race day, I'd never run before, but I vowed to try to jog as much of it as I could. I finished the 5K in 41:09, and was totally exhilarated. After a few days, once my soreness subsided, I wanted more. I wanted to run. I bought a Couch to 5K program for my phone and the rest, as they say, is history. This year, I was pleased to find out that the Big Ten Network had indeed decided to make this an annual event, and I signed up for the 10K race only hours after registration opened on the website. Friday night, now a seasoned runner, I did as any nerdy runner would do. I laid out my clothes for the next morning, down to the socks, and meticulously packed my race bag (selecting a bright yellow bag that I'd gotten from a previous race so as to make gear check easy). Saturday morning, I hopped on the first el train downtown (literally, the first train of the day around 5:30am), and joined the pack of people maneuvering to the new start/finish location near the Adler Planetarium. I was seeded in the F corral, but the corraling was a little disorganized, with people jumping flimsy barricades and stone fences when entrances to corrals got packed too tightly with people. The corrals, in my opinion, were still a little too over-full for the size of the course, and Mile 1 was largely spent bumping into people. The lakefront trail is not a wide avenue, and much of the race I felt boxed in and stuck by the swell of people. I think my pace probably suffered as such. I ended up being about two and half minutes over my goal finish time, finishing with a 59:19. I wasn't happy about my time, but I did also hit a big wall at Mile 5 with a problem that seems to keep happening. This particular time, I was breathing fine, my heart rate was fine, but yet, suddenly, it felt like my lungs were in a vise. I could still breathe just fine, but the chest pressure of course made me panic, which made me then feel even more like my chest was being crushed. It was a big vicious cycle. Does anyone else experience anything like this? If so, how do you combat it, distract yourself, or at least calm yourself down so you don't end up making it worse? This has happened my last two 10Ks and it's really caused issues for my times, not to mention my sanity! My own problems aside, while I was happy that the race had such a great response and I believe the organizers said they tripled their registrations from the previous year, I think that the literal width of the course is just too small for that many people. There was a huge crush of people after crossing the finish line as people filed by to claim their medals (which, however, are really sweet and shiny -- see left) and it was literally like herding cattle. The organizers do have to consider how a bottleneck venue will perform with as many entrants as there were. It was a bit of a mess as people (very) slowly shuffled to claim snacks, water, Gatorade, and bananas, then proceeding to the medals. Of course, all in my corral had the same gear check station, sectioned by bib numbers (of which all in the corral were of the same bib range). So as lines were scant at other gear check locations post-race, since of course my entire corral finished at basically the same time, there was a huge line to pick up gear at my section. I picked up my free school sunglasses (thankfully I didn't go to Illinois -- that sunglasses line was longer than the free beer line, whereas Northwestern's tent crowd was nonexistent). After picking up and guzzling my free beer and my free chicken sausage, I was about done with the crowds and was just so tired. I ended up stopping for breakfast at a nearby breakfast place on Michigan, but then headed home. Do I regret doing this race with those... disappointments in mind? Absolutely not. My runnerversary is a reminder of how far I've come and how much my life has changed in the past year. In a way, this race is responsible for my entire transformation. I'm a runner now. I have my good and bad races and my pace isn't perfect, but I am a runner. I went to the doctor today for an annual check-up, and I informed him of my weight loss and the fact that I am a runner and training for a half marathon. He did the usual stuff after we went over my history: checking my ears, throat, lungs, heartbeat. He noted that my BMI was very good and well within the healthy range. Then he did something that surprised me. Now knowing that I was a pretty intensive runner, he had me lie down on the exam table and then took my heart rate to measure my resting heart rate. When he announced the resultant number, it was all I could do not to drop my jaw in shock. He measured my resting heart rate at 44. According the to the Mayo Clinic, that is about the resting heart rate of a well-trained endurance athlete. Another site suggests it is the heart rate of an "elite athlete." Luckily I had told my doctor that I was a runner, because he said that otherwise, that sort of heart rate would cause concern (bradycardia), but for me just signals "a great deal of cardiovascular activity." But let's think about what a resting heart rate of 44 really means. It means that my heart is now able to work so ridiculously efficiently as a result of all my cardiovascular exercise (running) that it only need beat 44 times a minute in order to deliver the necessary amount of oxygen throughout my body. Most healthy adults (who don't run 15-20 miles a week as I do) have an average resting heart rate of 60-100 beats per minute. My mind is still basically exploding from this news. Eighteen months ago I was obese and sedentary. Even just six months ago, several months after I'd started running, I'd measured my resting heart rate to be nearly 90. The title of this blog post is quite literal. In 18 months, I have gone from obese to elite athlete. Recently, I'd been having some motivation problems. I had been feeling defeated by recent (small) weight gain and less than favorable training sessions. However, this news has most certainly strengthened my resolve, to the point where I cannot wait for that next 80 minute run. There is no possible way I could let that go to waste. What motivates you to go running? I don't mean the long-term goals, like losing weight or running a half-marathon. I mean your day-to-day motivation. The thing that pushes you out the door on any particular day. Had a bad day? Compensating for an unhealthy lunch? When I started running, my motivation came from negativity. I was living in a very toxic environment in terms of my relationship with a family member with whom I shared a home. I would get home from work every day and immediately run out and seek refuge on the road or at the gym. My sprint out the door accelerated if we were fresh off a shouting match, which was often. I would go out and just run, and run off all my anger and stress. It worked miraculously. After all, I did lose a lot of weight during the time I spent at home. If the shouting match was particularly spectacular, I'd sometimes do a near sprint for an hour and return home nearer to 9pm so I wouldn't have to spend a lot of time at home in my waking hours. In March, I bought my own place and moved out. I was living on my own again, and immediately I felt more at peace and less stressed. I was golden, right? Soon after moving, I felt my motivation waning. I'd force myself out the door to run, but I didn't enjoy it anymore. It didn't give me the same exhilarating stress release that had made running so attractive to me in the first place. They won't even good runs -- I'd usually run a mile, then get winded and stop for a few minutes. I felt so defeated. Where did the adrenaline go? Where did my "dammit, Erika, keep pushing" disappear to? In moving away and thereby "losing" my biggest motivation, though from a negative place, had I lost my motivation altogether? It's taken me this long to figure it out. Where the heck was my day-to-day motivation going to come from now? I'm still trying to find new motivation, but I believe that now I'm on my way. Today, I stepped onto my scale to see a troubling number, though one I'd expected given my less-than-disciplined July 4th weekend. Over the past month or so, I've gained back nearly 10 lbs after losing so much. I thought back to how much self-control I had when I hit my goal. I missed that. 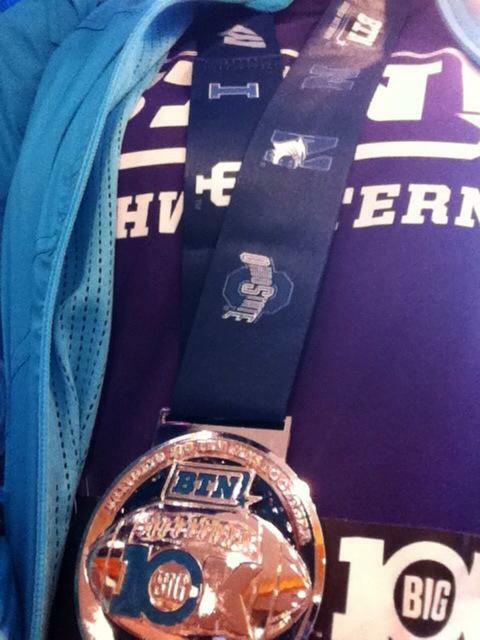 Today, my motivation was to get that back. My eating was spectacularly controlled today, and I capped it off with probably one of my best training runs ever. I feel good, in control, and pumped up. So maybe that's it. I need to remember this feeling and remember that going out and having a great run will make me feel this good. I still need to find other sources of motivation that don't come from negative emotions, but for now at least, I think I've re-discovered my mojo. It's never comfortable feeling so out of control. Wherever the motivation comes from, it's time to take back the reins.